Jennifer McDonald, owner of 904 Imports is bringing truffles from around the world to Vancouver chefs. She brings the fresh truffles right from the airport to her clients. If you’re a Vancouver chef you can sign up for her truffle notifications and be the first to know when truffles arrive. Now you know where to buy truffles in Vancouver. Hitcase is a Vancouver based company (right by Main St.!) that sells premium rugged iPhone cases that can turn your iPhone 6 or 6s into an action camera. Swappable lenses and GoPro compatible mounts make it a versatile phone case for the active west coast lifestyle. Watch their collaborative live stream during Discovery Channel’s Shark Week. Main Street mainstay since 1946, the Freeman family’s Windsor Meats has finally caught up with the times and is launching a new web site along with Facebook and Twitter pages to communicate with their fans and customers. You can sign up to their newsletter to get upates on their monthly meat and prepared items specials. 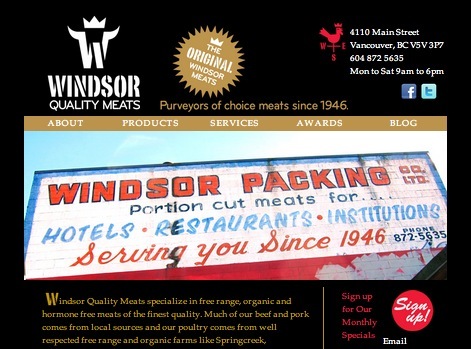 Windsor Meats specializes in organic, free range, hormone and antibiotic free meats from mainly local producers. Winner of multiple Georgia Straight, Westender and Vancouver Courier reader’s choice awards for Butcher of the Year attest to the quality of their product and services. A new specialty is a line of healthy dog food prepared on premises. Biologically appropriate raw food (BARF) for pets is available by the pound. Using raw meat and a mix of 15% vegetables, you pets get food that is healthier and more nutritious than standard products. 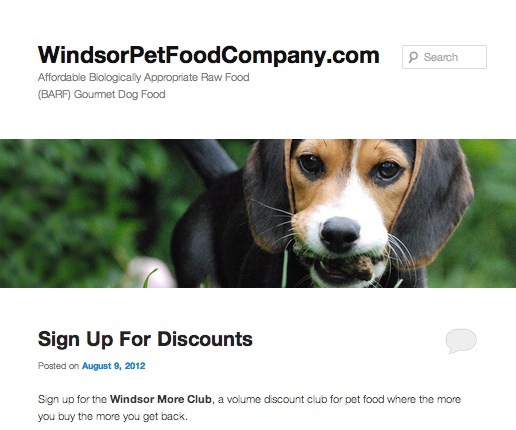 With the launch of the new Windsor Pet Food Company web site you can sign up for the Windsor More club and get volume discounts on your premium pet food purchases. Sign up here. 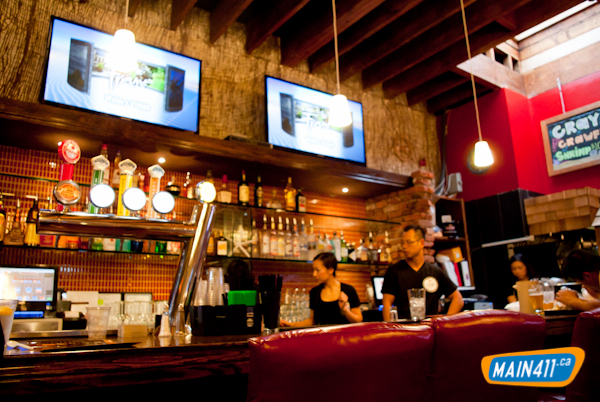 Acorn is officially opening next Tuesday. I wasn’t invited to tonight’s private event but I did crash the party late. I already covered the Portland Craft opening during Vancouver Craft Beer Week. The place was packed with lineups out the door for opening day. Due to other obligations I never got the chance to try the food. This is my first visit after the initial first day craziness. Dinner consisted of Rainbow Trout Tartare and the Pig and Pots braised pork belly. Sometimes the simplest things are the best as the orange zest really made the tartare dish. I found myself picking the zest spread out as garnish and dropping it on the tartare. The standout of the two would be the pork belly. The jus was excellent, as were the roasted shallots and the baby potatoes that came with it. Good deal at $8. Being the glutton that I am, I had to order something else to fill out that little bit of emptiness in my stomach. Hey, how about a pizza? Oy, that turned out to be just too much food. The pizzas change daily with a meat and a veg option. Today was capicolli and onion. Beers tried. Deschutes Mirror Pond Ale and the Alameda Yellow Wolf Imperial IPA. There are no bad beers on the list that I can tell. I’m still trying to find a gallery for this site that works the way I want. 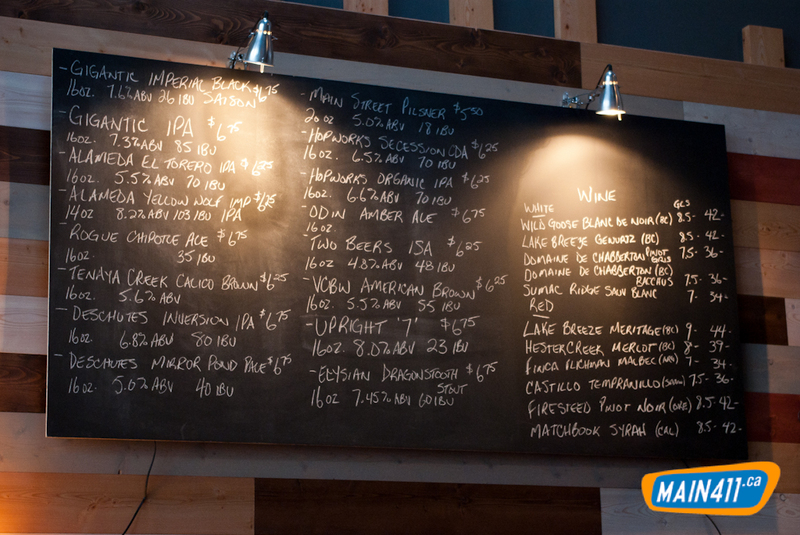 In the meantime, click this link for a large image of the full Portland Craft beer selection. This is the first time that the full beer list is published anywhere. There is no beer or wine list on their site yet. 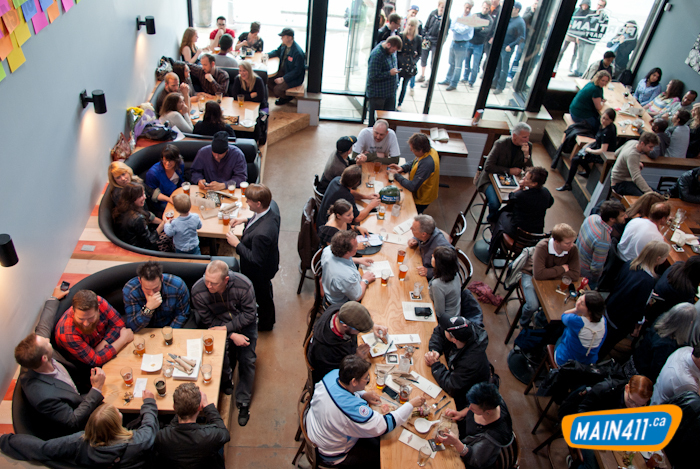 El Camino’s is the new place that has taken over from what was once Latitude. I’ve been dying to check them out since the changeover. El Camino now has a much more focused menu base around Latin American street food with most items under $10. Empanadas, tacos, bocadillos (Mexican subs), arepas and salad bowls. I’ve always been a fan of the old Latitude’s arepas, crispy white corn pockets with meat or shrimp stuffing. The ones at El Camino are just as good and seem a little bigger even. Tacos are 2 for $5 on Tuesdays so I had the fish tacos (Baha cod), a gambas arepa and the carne guisada arepa. The fish tacos were crispy and not overcooked and I really liked the pickled slaw on top. The arepas were well stuffed and having confessed to being a fan I could eat these all day long. I recommend ordering 2 orders of tacos or arepas for a filling meal, 1 order is good as an appy or snack. As with so other restaurants’ web sites I wish they would stop putting pdf’s of their menus online and use an actual smartphone compatible web page instead. Downloading PDF s are so 2000. I’ll definitely go back to El Camino’s and try their epinadas and bocadillos and sample some of the wines. Wow, what a great opening for a new place on Main. It seems we have been wanting our version of BierCraft at the old Coppertank location at 3835 Main for a long time. The Portland Craft opening started at 5:00pm and almost immediately the lineups started. I was fortunate enough to get in for some photos and beer tasting. Thanks Chris! Portland Craft has made some welcome changes to the cavernous room to make it more warm and inviting. A large tall backsplash board lines the wall behind the taps, most of the large screens have been removed except for 2 by the front door. The booths chairs have been redone and it looks like the central area have been totally revamped while maintaining the long tables. The combination of the Public people with the chef from the Regal Beagle and several other partners seem to be on the right track. They plan to feature mainly US beers with about 15 on tap and 16 different bottles and their own in house Pilsner. Taps I saw included several Deschutes, Lagunitas, Las Vegas Pilsner, Secession, Kolsch, El Torero, Dragonstooth, Hopworks and Gigantic Brewing’s IPA which I had with the brewer and it was wonderful. There was also a keg of Russell Brewing’s stout that was top notch. The food prices are very reasonable broken down into $5 and under, over $5 and over $10. The chicken and waffles look amazing and the veggie shepard’s pie was popular item as were the house made potato chips. All in all, it looks like a great start for Portland Craft. 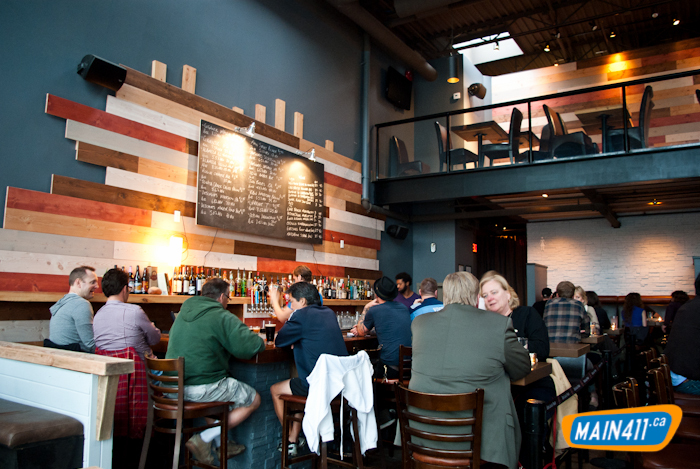 Read our first food review and Portland Craft’s full beer listing here. http://main411.ca/site/wp-content/uploads/2016/07/main411-logo.png 0 0 mainstreeter http://main411.ca/site/wp-content/uploads/2016/07/main411-logo.png mainstreeter2012-05-24 20:20:412015-11-26 11:08:11Portland Craft Opening! Actually the new Chai on Main St. opened last Friday. I didn’t make it till there till Monday night and only by accident as I was on my way elsewhere. Being unprepared I did not have the right wide angle lens with me and since I was rushing elsewhere I only had the quinoa salad and dessert of Gulab Jaman. Consider this just a quick look inside the new location. The place is gorgeous, created from scratch with high ceilings, it’s well over twice the size of the old location and the owner Sonya says it has been two years in the making. The menu has expanded as you can see below. The old location is dedicated for lunch and the new spot is for dinner. Some people still like the smaller location for it’s coziness. I will make a second trip with a proper lens and order a full meal. http://main411.ca/site/wp-content/uploads/2016/07/main411-logo.png 0 0 mainstreeter http://main411.ca/site/wp-content/uploads/2016/07/main411-logo.png mainstreeter2012-05-23 03:32:352012-05-23 03:32:35Chai On Main Opens!